The old “Goblin Cut Gold Mine” is up in the hills, verging on what would traditionally be dwarf territory. But the lack of dwarven interest was appealing to the local lunatic when he found a small gold vein when hunting for some odd minerals required by the local apothecary. Today, however, the vein is getting harder to trace and the mine has grown from an open pit mine to a three different levels and lines where the vein has been worked since it was found. The three levels of the mine are the Goblin Line (the original dig after switching from open pit mining) which extends from the original shaft to the new shaft and beyond. Above the Goblin Line is the Goblin Gallery, and below it is the Deep Line (which has a small room off to the side to store goods and to eat and drink when miners don’t have someone to winch them up for a break). There are of course multiple stories about the origin of the name of the mine – the main one being that a number of defenses had to be staged at the mine by the two to five miners who work here against goblin incursions. These stories are told and retold and exaggerated beyond belief by the miners when they return to town to brag of their exploits and spend their gold. Sadly, the true origin was that the local lunatic who first found the gold vein originally claimed that the gold nugget he pried from the earth here was actually cut from the nether regions of a strange “golden goblin” that he had run down and captured. Any number of adventures could be staged at this location – such as recovering missing persons, exploring the now-decrepit shafts and lines for a lost MacGuffin, or even an actual invasion by the titular goblins who then chase the remaining miner down the hills and into town. Another great map! Long overdue in letting you know how much I have enjoyed and appreciated your work. Glad to be a Patreon supporter. 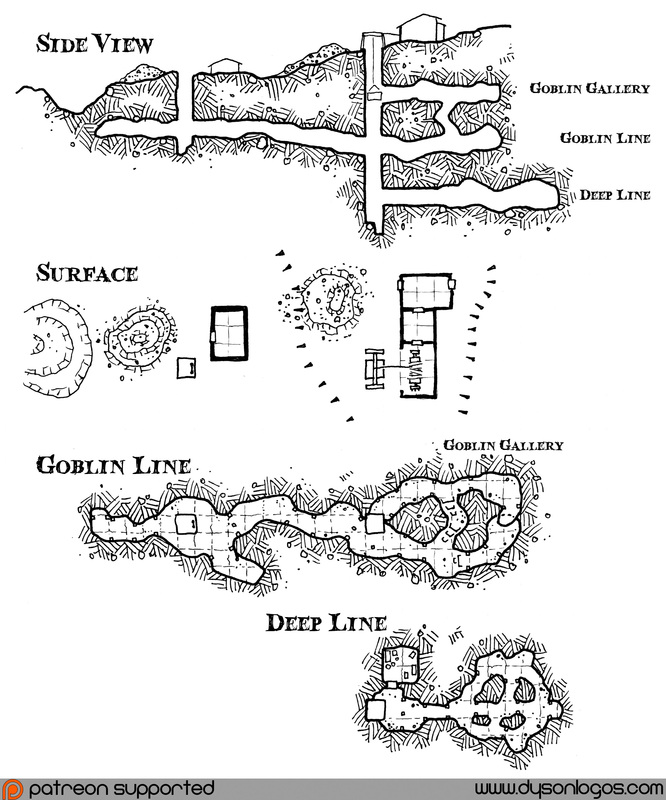 Got a question… What fonts do you use in your maps and on your page titles, as in ‘Side View’, & ‘The Goblin Cut Gold Mine’? On this map I think I used “Blood Crow” or something like that. The main font I use for most graphical headers around the blog is Satan’s Minions. Any map with goblins and mines is going to find a use. Especially for a low level scenario!